HIV-related stigma is still persistent around the world with a lot of consequences for the people living with HIV, both on an individual level as community level. Dr. Lazare Manirankunda did research about HIV-related stigma in the sub-Saharan African community and will share his results with us. Afterwards we’ll go into discussion with each other based on a few statements and see which interventions are possible to reduce stigma together. 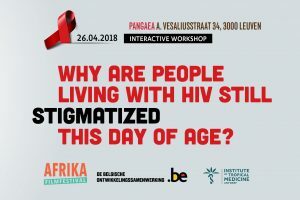 The Afrika Filmfestival and the Institute for Tropical Medicine have organized an interactive workshop on the 26th of April from 8pm untill 10pm on the stigmatization of individuals living with HIV.